Perseverance, hardwork, and attitude matter. They certainly mattered for Mets pitcher Seth Lugo. The odds of a 34th round draft pick making the major leagues can sometimes seem as daunting as a 34-year old accountant making the major leagues. Only one player selected in round 34 of the 2011 draft has made the major leagues and that is Seth Lugo. 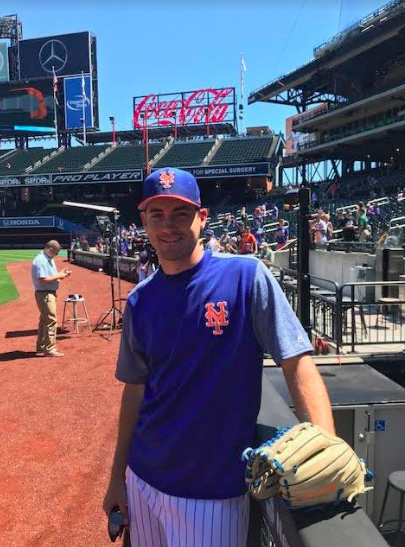 Prior to Sunday’s game between the Mets and Tampa Bay Rays, a 9-0 Mets defeat, I had a chance to chat with Lugo about his journey to the majors. As we chatted along the dugout railing, the Louisiana native said (in an accent reminiscent of Ron Guidry) he didn’t realize the odds were against him. “I didn’t think of myself as a 34th round pick. I figured if I’m on the team, I have a chance.” To find the perseverance to make the majors, Lugo proudly cited the work ethic he learned from his father, a cable installer for 33 years who now works for rocket maker, SpaceX. Lugo was especially grateful for Stephens’ impact on him. Stephens imparted to Lugo how to pitch on a professional level; for example, the importance of changing speeds and pitching up and down in the strike zone. Under Stephens’ tutelage, Lugo fastball increased from 84 mph to 94 mph between his sophomore and senior years. The righthander debuted with the Mets down the stretch of the 2016 season as he and Robert Gsellman helped pitch the Mets to the Wildcard game. Since then, he’s employed the same work ethic to stay in the majors, working on his curveball and command, and transitioning to the bullpen in 2018. We talked about his conditioning routine, which differs for starters and relievers. Whereas starters have a set routine between starts, Lugo said he has to be ready everyday as a reliever; therefore, weightlifting (without overdoing it) is emphasized while running is a lesser part of his conditioning than if he was starting. When pressed into the rotation on May 31 after 20 relief appearances, Lugo admitted being “completely gassed” after four shutout innings against the Cubs. I asked him about the importance of proper pitching mechanics, and Lugo said sometimes mechanics can be corrected between innings and other times it can take a month. Recalling his most recent start against the Pirates, Lugo said his curveball “wasn’t sharp” and his fastball “had no life” in the first two innings; however, after chatting with catcher Devin Mesoraco and pitching coach Dave Eiland between innings, he began to drop his back foot slightly in his delivery to better results. I asked how he felt about people who say pitchers are coddled and he acknowledged thinking about it. Displaying the competitiveness that saw him close games on Fridays, play centerfield on Saturdays, and throw 140 pitches in a college game on Sundays, he said he would’ve loved to have pitched in the era of complete games, but he acknowledged pitchers throw harder nowadays and injuries are a concern.